Beginning in April 2018, Tri-County EMC will work with NaturChem for herbicide application to keep trees, brush and foliage from interfering with the delivery of your electric service. Overgrown trees and other vegetation within 20 feet of overhead power lines are trimmed year-round. Herbicide is applied to brush in five year cycles. This year’s herbicide application will occur in southern Baldwin, northern Wilkinson and eastern Jones Counties. The map to the right shows the general area where the maintenance will occur. Click the link below for a full list of roads that will be affected. Only nonrestrictive, non-residual chemicals are used. Landscaped areas such as lawns, streams or ponds will not be sprayed. Keeping the lights on and providing safe service are two of our most important goals. Managing vegetation growth around power lines is critical to reliable service. Limbs brushing power lines will cause blinks or temporary outages. Failure to maintain our right-of-way will dramatically increase the number and duration of outages resulting from severe weather. And vegetation touching a power line poses a potentially fatal risk to the public. 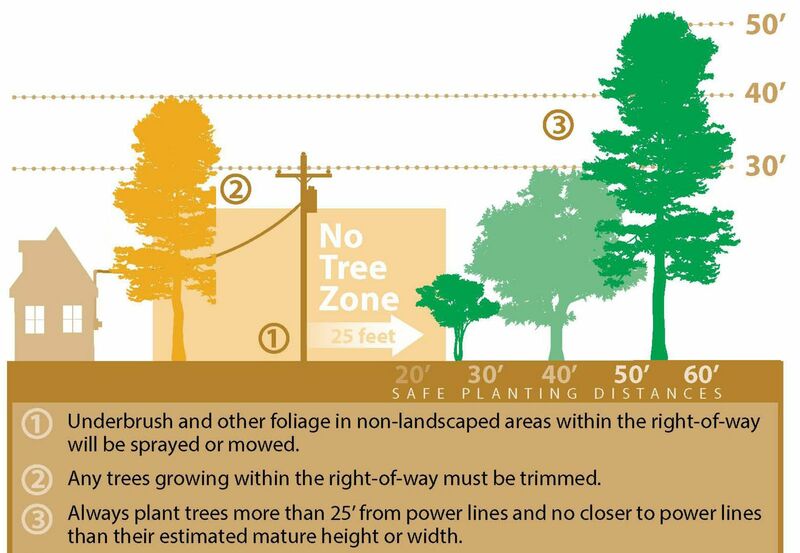 Tri-County EMC maintains a 30 foot wide right-of-way using mowing, trimming, and spraying to control vegetation, particularly fast growing trees, which can grow up into power lines. Because it is less invasive, spraying is utilized where possible using a blend of selective herbicides. Although these herbicides target trees and underbrush, yellowing of grass underneath may occur. Tri-County EMC does not spray yards or other landscaped areas or ponds, streams or other wetlands. A 100 foot buffer is maintained around these areas. However, trees that grow near primary power lines in yards must be trimmed sufficiently to prevent safety hazards and outages. Tri-County EMC uses a 5-7 year right-of-way spraying cycle. A map is published each year prior to the start of any spraying showing the approximate area where spraying will occur. The chemicals utilized by Tri-County EMC for spraying right-of-way are a blend of herbicides commonly used in residential, commercial and agricultural applications and have been used successfully by utilities and homeowners for decades. They have been thoroughly tested and are approved for use by the EPA, OSHA, and other agencies. Anyone having concerns about trimming or spraying of right-of-way is encouraged to contact Tri-County EMC at 478.986.8100. How Often Do You Trim Vegetation? Tri-County has a 30 foot right-of-way on high-voltage (primary) power lines. Asplundh, Tri-County EMC’s trimming contractor, trims trees around primary power lines every 5-7 years. Our goal is to reach every line on our system - about 2,100 miles - and then start again. Is An Overgrown Right-of-Way Really Unsafe? Accidents happen quickly. The weight of a child climbing on a tree limb that has grown into a power line can quickly cause it to become energized, posing a threat to the child. And adults can also be at risk when trying to do yard work in the trees that are close to a power line. Does Clearing Right-Of-Way Increase Reliability? Trees, or tree limbs, falling into power lines can knock out power to hundreds of members in a short amount of time. Trees can cause power lines to snap and can bring down power poles with their weight, causing lengthy power outages. While not all outages can be prevented, we can easily minimize damage and outage time by keeping right of way clear. In 2016, 44% of outages were caused by trees. 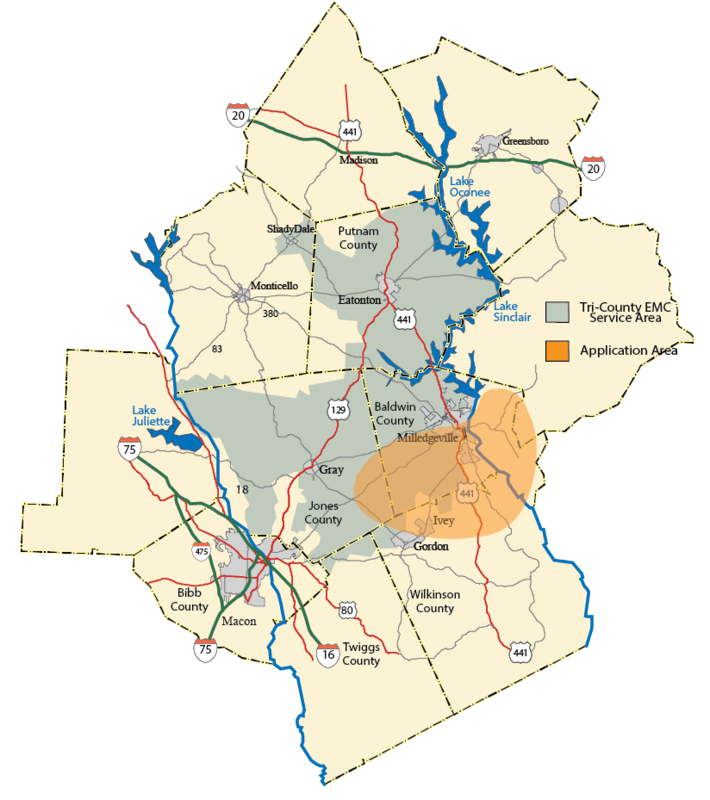 By amping up right of way efforts, Tri-County will be able to reduce outages in the future. Why Do You Trim Trees On My Property? While most vegetation maintenance is performed along primary power lines, which typically run along major roadways, at times it is necessary to trim on a member’s property. We have an obligation to our members to keep the power on and provide a safe electric system. Tree limbs growing into power lines, or dead trees that could easily fall on lines, could cause power outages and fires. Where Is It Safe To Plant Trees? By planting bushes and trees at least 25 feet from the power line, you can help us hold costs down and increase your power reliability. As a guide, refer to the illustration above. I Have Underground Service. Can I Landscape Around The Transformer In My Yard? Just as our overhead lines need clearance, so do our underground transformers. Keep shrubs at least 10 feet from the sides and backs of our equipment; don’t plant anything directly in front. Doing so hampers our crews making outage repairs if they have to first trim shrubs to gain access to our equipment. Are your right-of-way workers Tri-County EMC employees? No. We utilize Asplundh to conduct right-of-way trimming and NaturChem for spraying. Both contractors have specialized equipment and training ideal for maximizing the efficiency of our right-of-way maintenance.